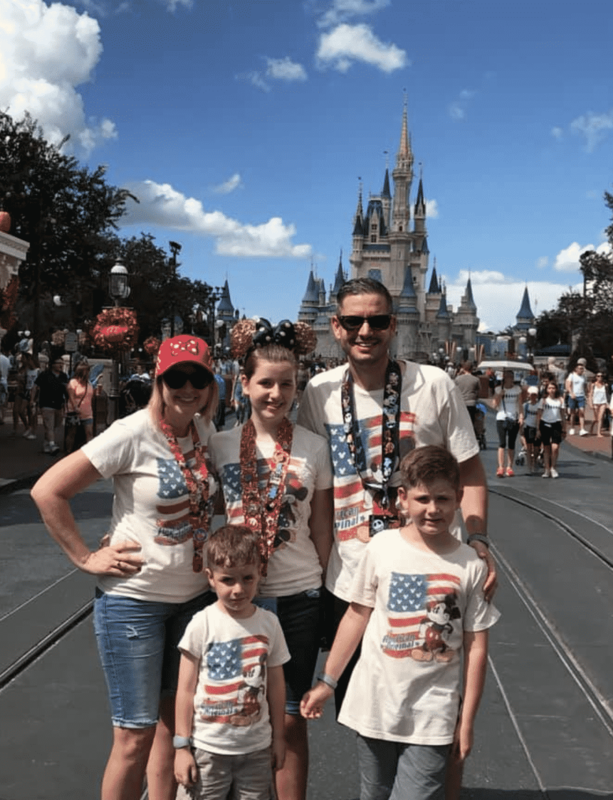 If you are heading down to Disney World, matching Disney shirts are a must! It’s a great way to add a little extra pixie dust to your trip with family and friends. There is something so special about going on vacation with matching family shirts! I promise – it is super fun! I’ve done it and everyone that was involved had a blast, including my husband. Yes, I will admit, he wasn’t too thrilled at the notion while I was setting it all up at home. But once we were walking down Main Street in our Disney family vacation shirts, the man was 100% on board! 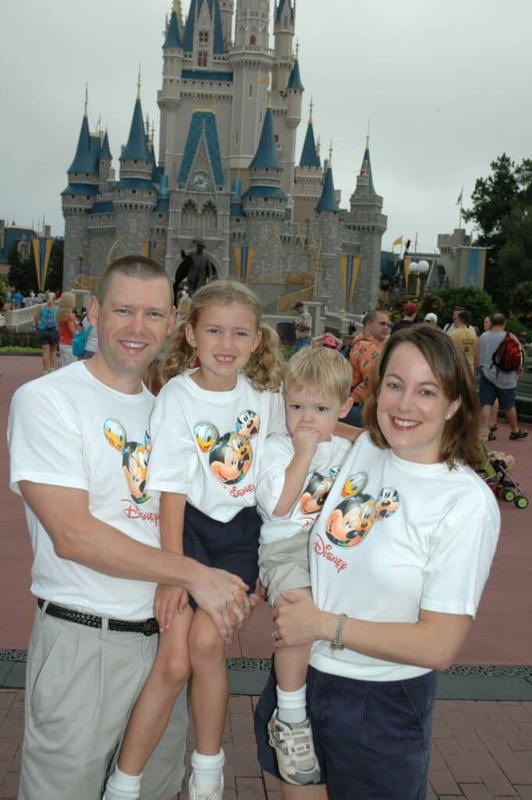 Disney vacation shirts can be customized to have personalized messages or inside jokes. They can have your family’s last name, your home town, your Grandpa’s favorite saying, your pet’s silhouette… it’s all fair game I mean, the choices are literally endless. Matching family shirts are best when they are hand printed and made to order. YES, you can pick a bunch of shirts out that all look the same from your local store. But have some FUN and design your own on sites like Etsy or Amazon and really have a blast. But do you have to do it that way? HECK NO! If you are the type of person that just wants to grab 5 of the same mouse ears and call it a day – then you win, too! Anything goes while walking around the happiest place on Earth. I love to share Disney tips and tricks on my blog. It’s one of our favorite places to visit. So, I thought it would just make sense to add some fashion tips as well. 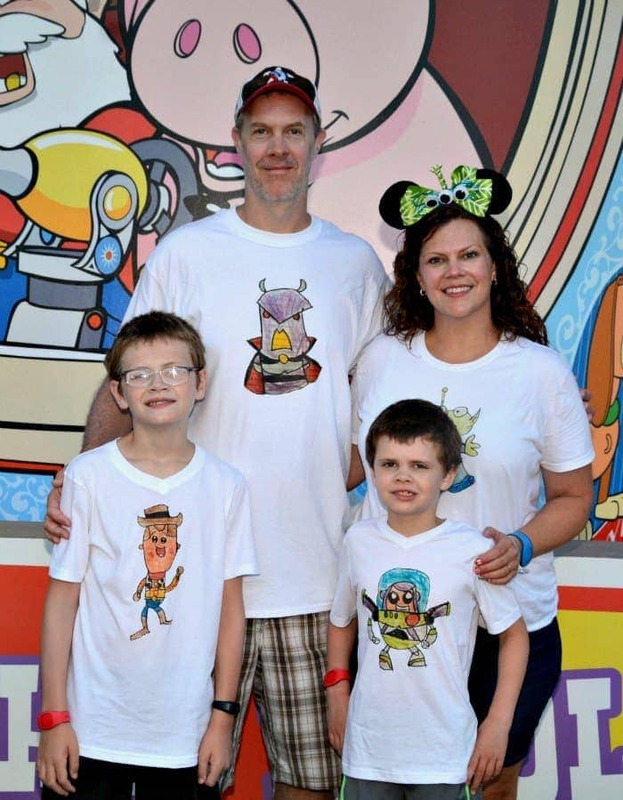 Here are some matching family Disney shirts that I found online that I absolutely love. As you can see, the last time we headed down to Disney, I went with several friends and we did this on our trip! 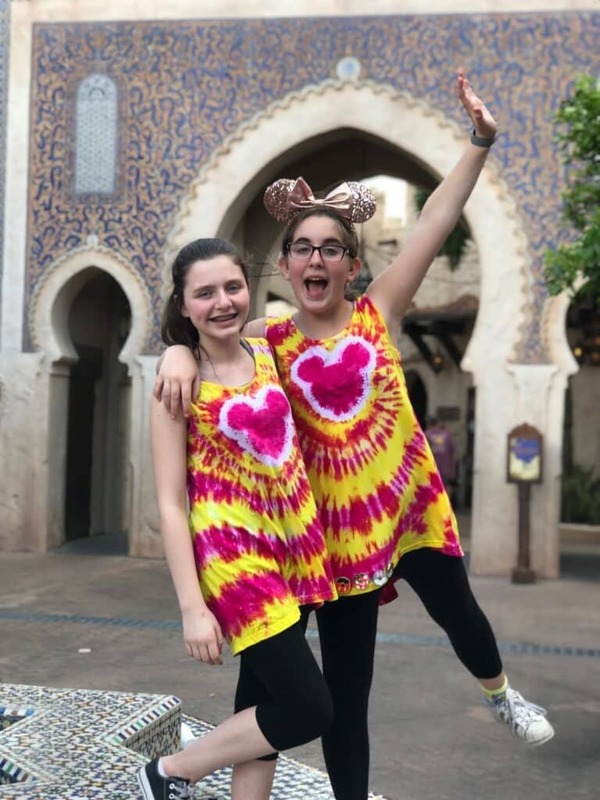 We had our teen girls rock tie-dye tunics in yellow and pink and they LOVED THEM TO PIECES. In fact, Natalie still wears this shirt ALL THE TIME. It was money well spent. 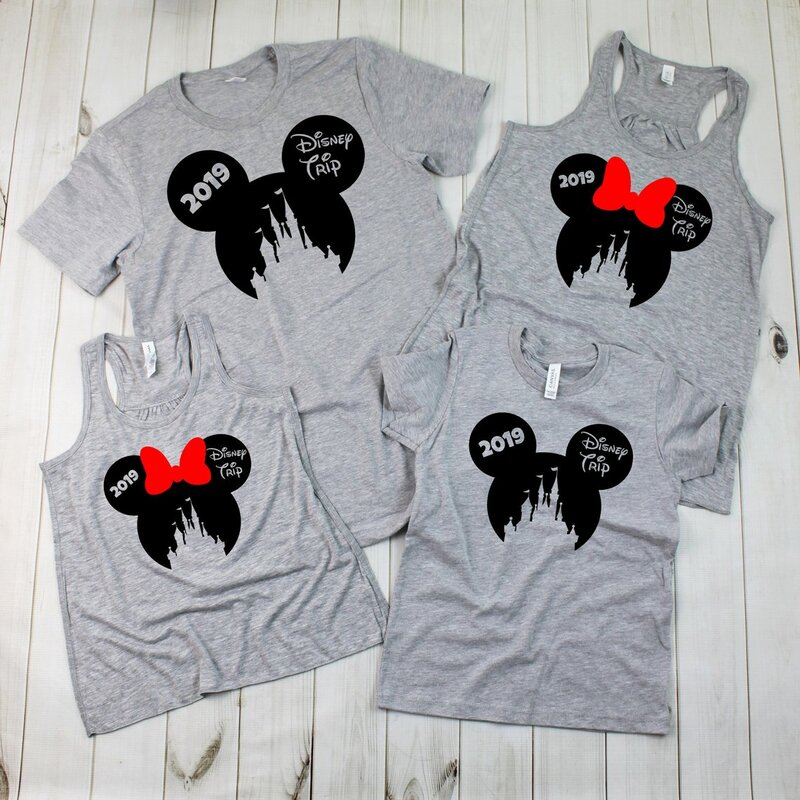 If you don’t want to really get SUPER personal with your design, but you do want everyone to have a uniformed Disney look, you could opt for shirts that have Mickey Mouse ears and castles on them as well as the trip’s year. You can alternate between t-shirts and tank tops. Do not worry about everyone having to wear the same TYPE of matching Disney shirt. If dad doesn’t want to wear a tank, then dad doesn’t have to wear a tank. 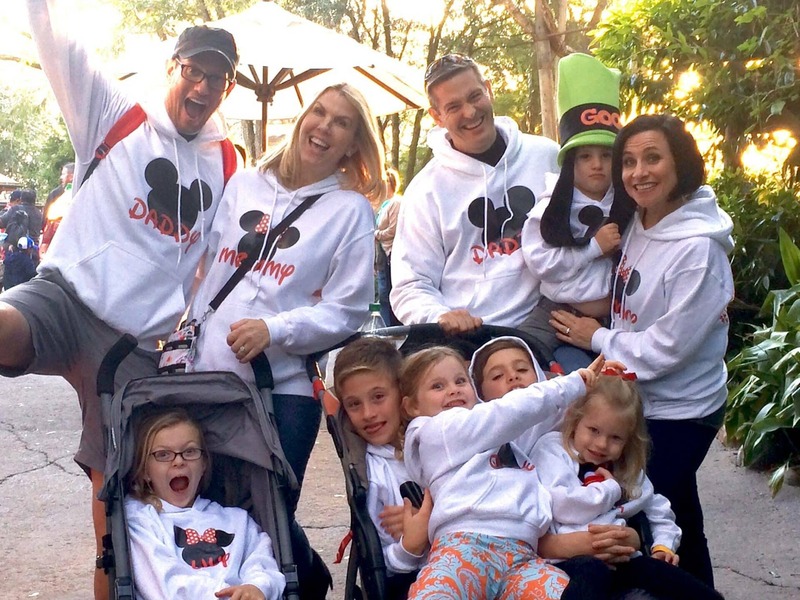 Is your family absolutely Incredible?! How about getting everyone in the family to grab an Incredible t shirt in their size and call it a day? I just love this idea. Not only because I am such a fan of the movie, but because the red is so bold and bright that it will help you spot your missing loved ones with ease. 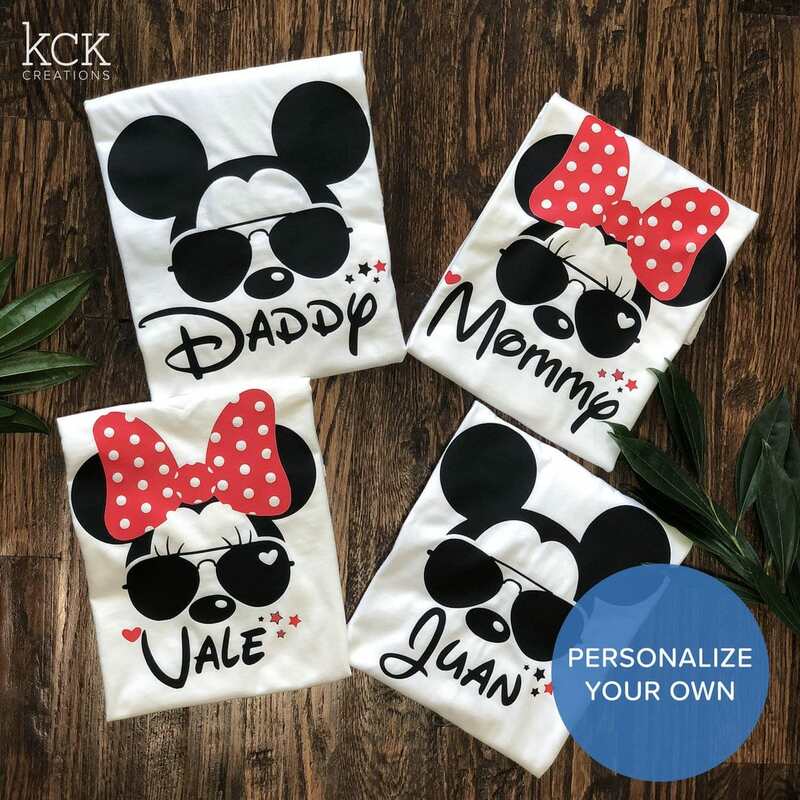 This is another great matching Disney shirts option for people who are still looking to show that they are grouped together but don’t want to write their names on their clothing. It’s FUNNY, right? The parents are broke and the kids are spoiled. It’s funny because it’s true. And by funny I mean I’m crying. Do you have a favorite Disney song? Split it up and put it on two or three shirts! Then it will only make sense if you are all together. This lyric from Frozen is absolutely perfect for couples because of the meaning behind the tune. Just look at this cute duo -> “We finish each other’s sandwiches” which, of course, should have been “sentences”. Such a cute scene! Thanks for this matching family shirts idea, Melissa from Sippy Cup Mom! 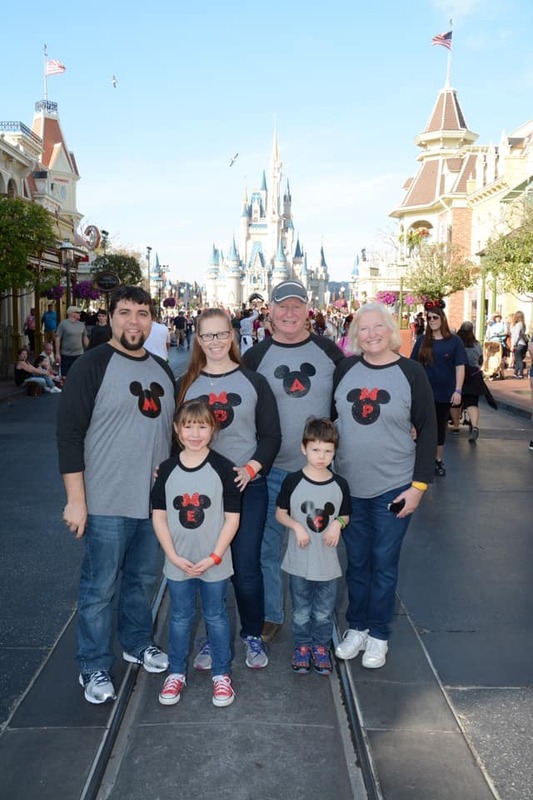 This is where we can start to personalize the matching family Disney shirts. As you can see in this example, Mom and Dad opted for their family names, but the kids got to put their real names in print. If you don’t like that idea, you can choose Big Sis and Lil’ Sis instead. The choice is yours. 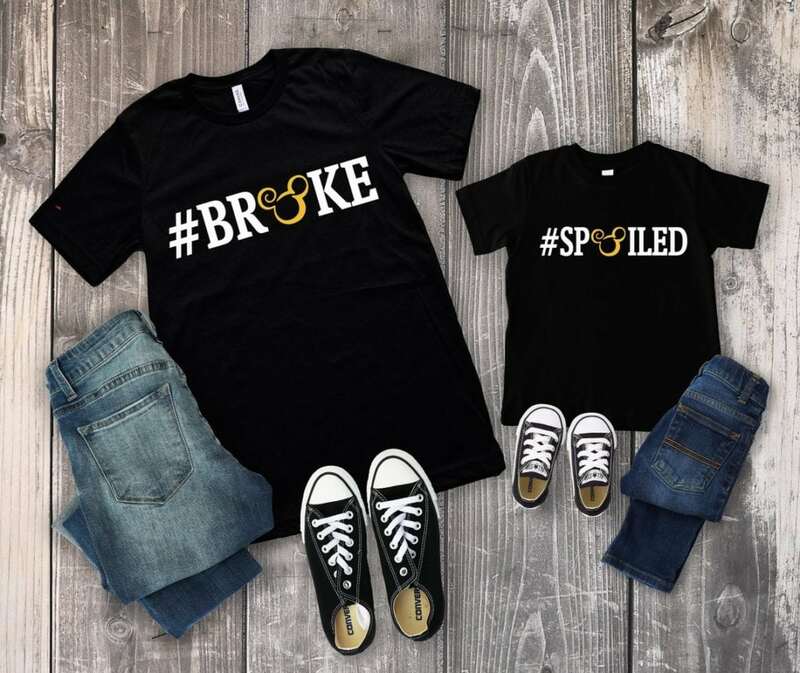 I know a lot of people shy away from getting personalized shirts because they don’t want their child’s name on clothing and I am totally with you on this. You don’t have to do that! Just put something that relates to them in some way. Brother and Sister both work perfectly. Matching Disney Shirts – Oh Mickey! 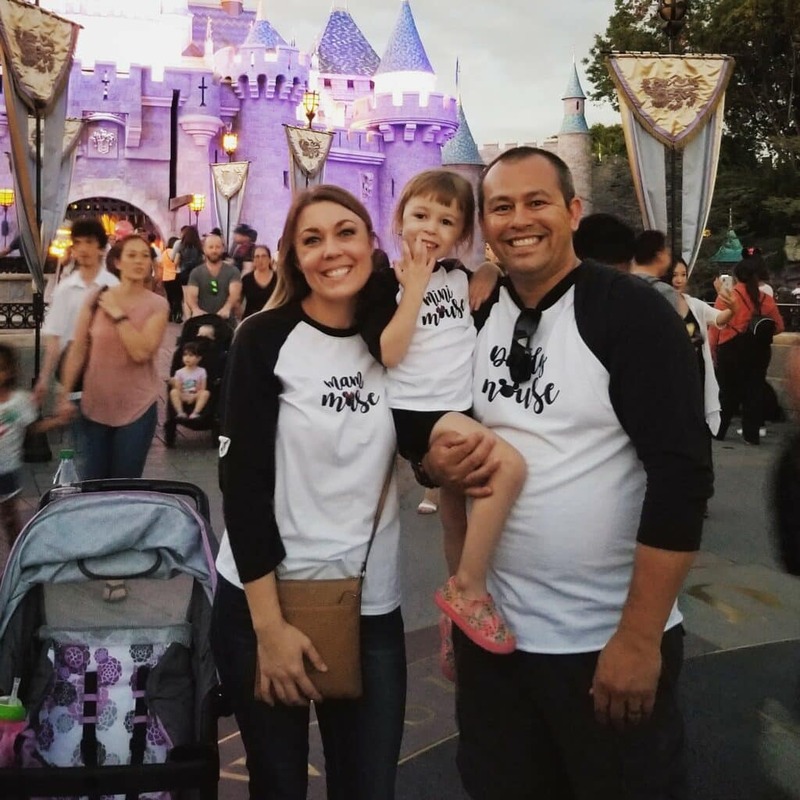 Looking for simple Disney family vacation shirts? Opt for good ol’ Mickey! Beau from Lunchbox Dad and his family wore these super fun classics on their recent trip down to Disney World and everyone looked like one big party. I love it! And PS – check out those PINS! 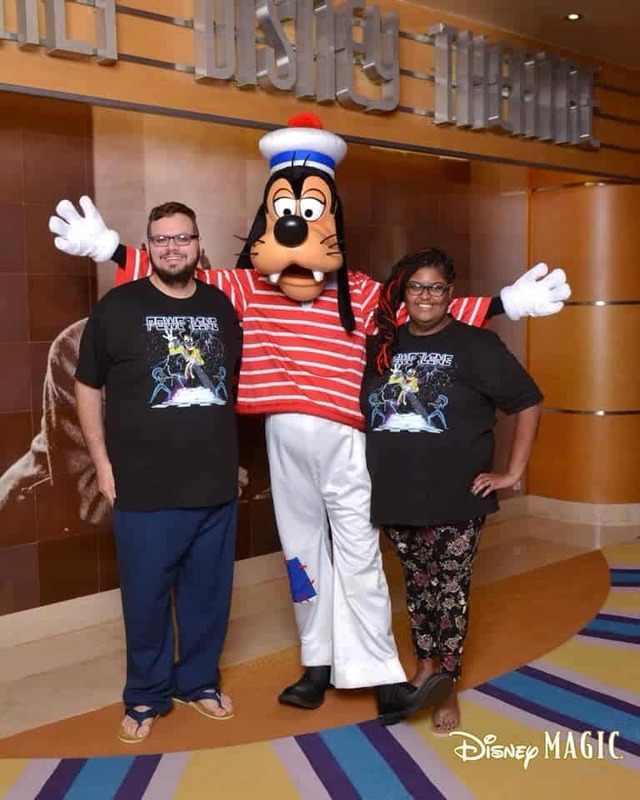 Disney vacation shirts aren’t just for kids! Friends and older family members are opting for this trend as well and I am so happy for it. It doesn’t have to be overstated. It doesn’t have to be over the top. You just have to coordinate your style and come up with a consensus. You can have the group decide collectively or tap someone to be the creative director and surprise everyone once you all meet in Florida. At that point, the director can unveil their matching travel shirts choice and see what everyone thinks! Any Star Wars fans out there because I have a couple themed matching Disney shirt combo that is to die for! This is IT! I love you… I KNOW. OMGRIGHT? And then the little kids are just wearing Star Wars shirts? Stop it right now because I cannot handle this. My friend Cindy hit this one out the park! Super cute and unique. I’ve been to Disney SO MANY TIMES and I’m not sure I’ve come across something like this before. 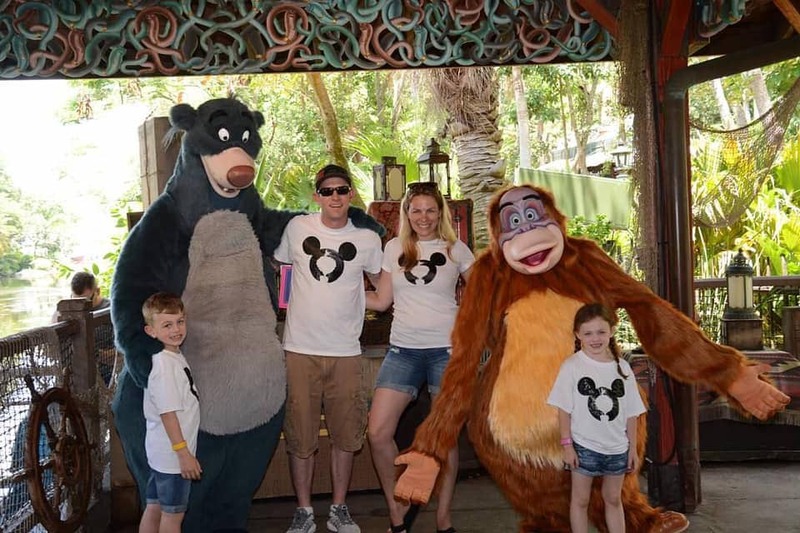 Matching Family Shirts Can Be… Anything! And by the way. What’s all this talk about t-shirts? You can match anything you want! Hats, fans, fanny packs, shorts, backpacks… whatevs! As long as you have some sort of theme going on – you are doing it right! 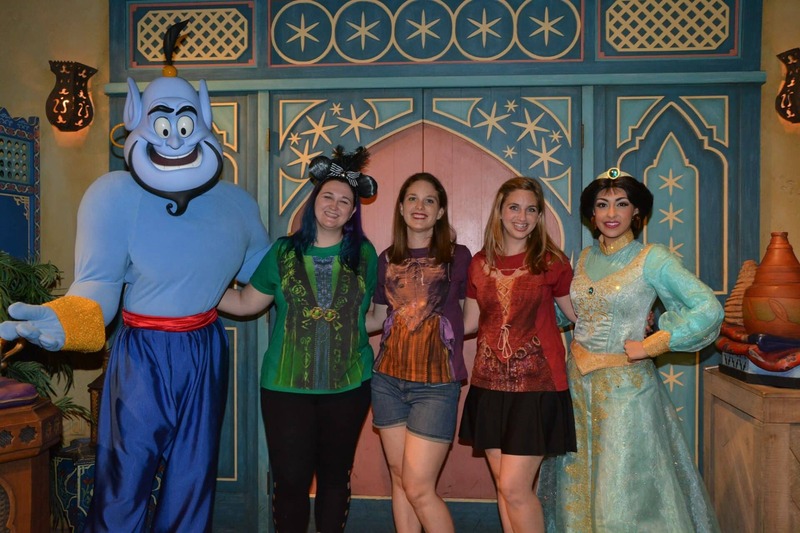 I can’t have a matching Disney shirt post and not put up a few more of my personal photos, right? When I went last year during Easter week, we actually spent Easter in Epcot. 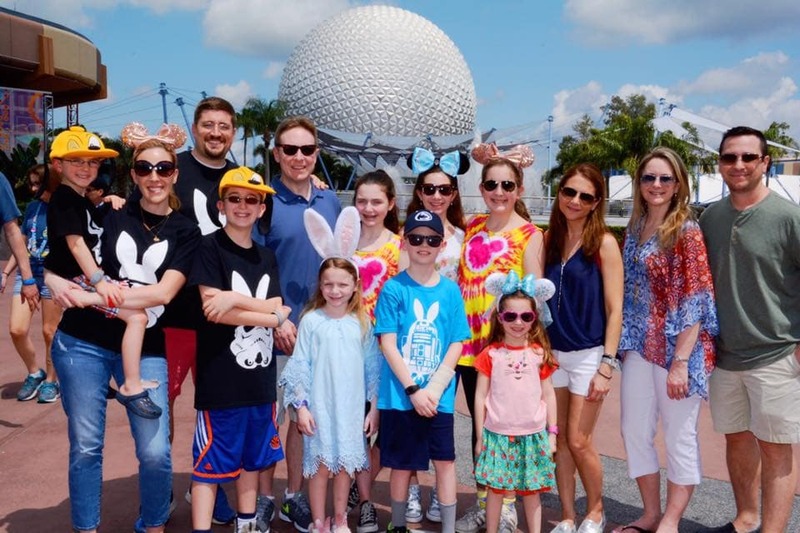 I thought it would be fun to get my clan in Stormtrooper shirts with bunny ears to show that we celebrated the big day AND we were fans of the mouse. This shirt is no longer available, but I linked to similar options above. Those Etsy folks can sure get creative. I have a tutorial on Lady and the Blog that teaches you how to make your own t-shirts using just about anything. EVEN THE free coloring pages I give you for all those fab Disney movies! 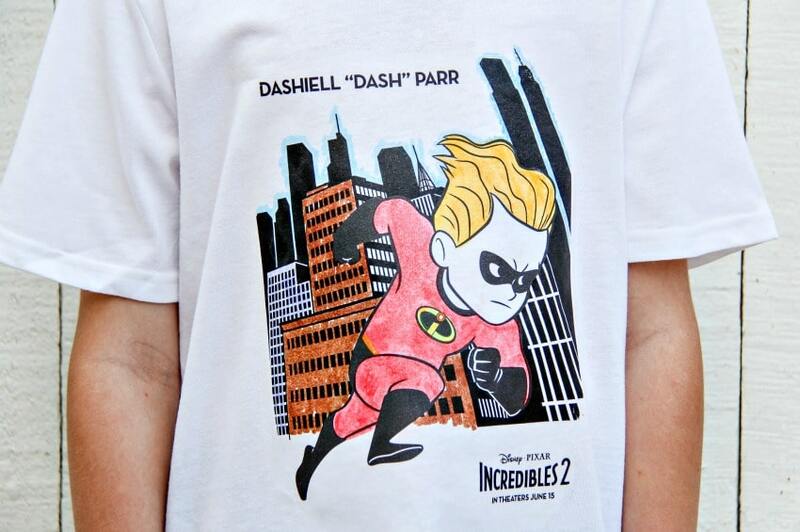 Here is a t-shirt we made for Incredibles 2. 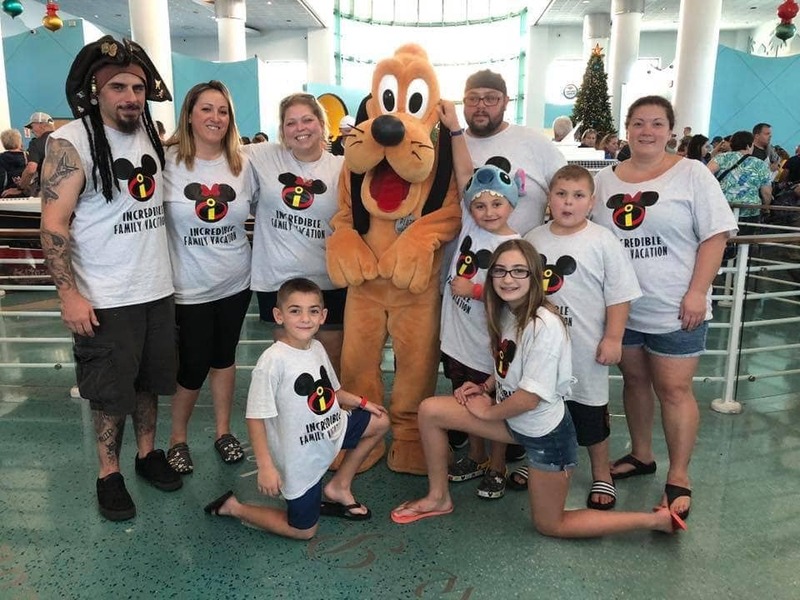 Your family could make matching Disney vacation shirts of your favorite Disney movie and then color them in and customize them however they want. How fun would that be?! You could also choose to show off your favorite Disney movie as a couple, too! And if it’s one that’s an oldie but a goodie, I bet it will spark some conversation. Have a favorite villain? Disney Princess? Classic cartoon? Express yourself – but do it together as a unit. Such a classic! The Thing One, Thing Two concept. Customize each shirt and say a little something about each child. As you can see, we have Trouble 1, Trouble 2, and Lil Monster 1. LOL! Love how this family likes to have a good time. Again, you don’t have to ever put your names on anything if you don’t want to. It’s not about that. It’s more about creating memories together. And you can do that while wearing Disney family vacation t shirts! Are you visiting on a holiday? Similar to my Easter stormtrooper design, you can also find plenty of options in traditional stores if you plan ahead for any upcoming trip revolving around a national day off. Just do yourself a favor and shop for these looks NOW BECAUSE THEY WILL BE HARD TO FIND. I love these American flag/Mickey Mouse designs. Perfect for July 4th, Memorial Day, or Labor Day. I just know that I would drive myself crazy trying to look for them three days before we were due to fly down to Florida. So, as soon as you know you are going – start looking because these are a home run. I love this shirt! I’m not sure it would make sense for my husband – but this is a good one if you have a trip planned with all female cousins or best friends or maybe even a mother-daughter adventure. How CUTE are these? 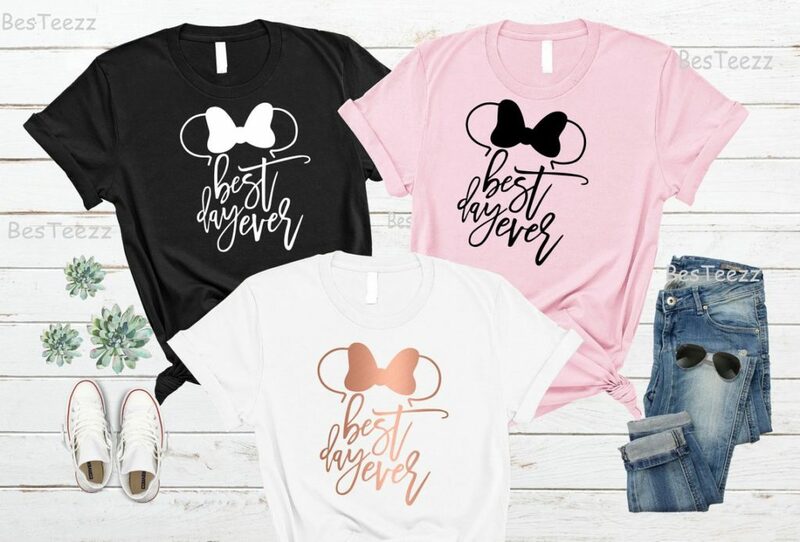 I just had to include a Disney Best Day Ever shirt into the mix! Ok – these Disney vacation shirts are super cool and I cannot get over them. My friend, Andrea and her family wore shirts that her son designed and I am absolutely in LOVE. You could always iron on your own designs created by your children. What a fantastic idea! And in all seriousness, I would buy these. 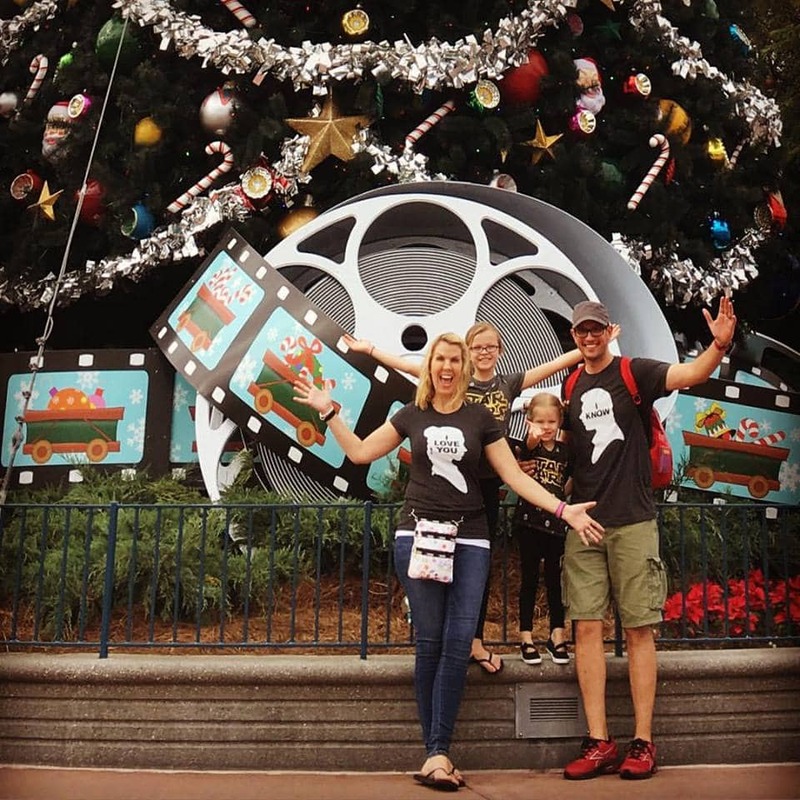 Every Disney vacation shirt has a meaning – create what you think is special for you and your family and then get prepared to have conversations about them as you walk the park. Disney fans are special. We really LOVE Disney. It’s not a hobby. It’s not a phase. It’s not anything that we will ever grow out of. So, when you are walking the park and you see a shirt that you want to know more about, it wouldn’t be a strange thing to approach someone and spark a conversation. Don’t be afraid to test your imagination and build out a design that you truly love! Make new friends! The mouse really is magic. 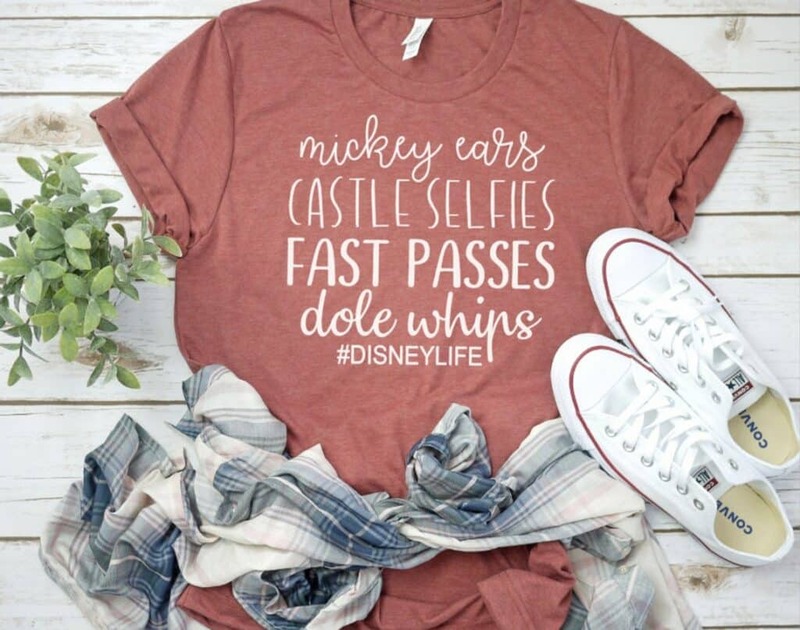 I say teenager for life, but if I am being honest with you, I would buy this shirt if I was going down to Disney World and my daughter and I would both be wearing this one. Um… this is adorable and right up my alley. In fact, give me the whole darn thing – the Converse, the plaid shirt, the skinny jeans. Just wrap it up and Amazon Prime it right over to me. I don’t even care what my husband wears. I just want this shirt. My God. Screw this whole matching Disney vacation shirt thing that I am putting together. I don’t even care anymore – I just want this shirt. 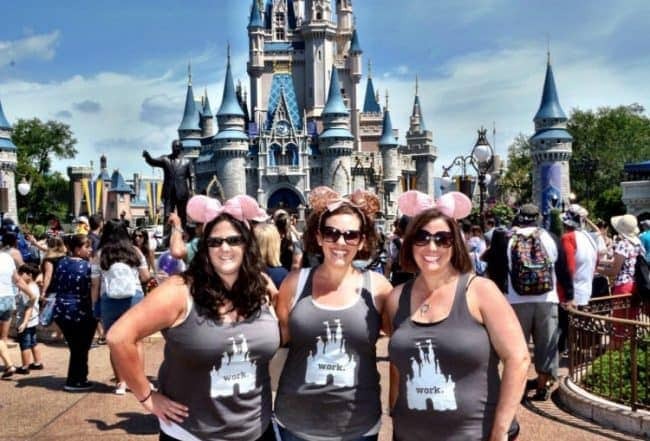 Krystyn and her friends proved that it’s not only families that are having fun matching vacation t shirts at Disney. Friends can go out and have a great time as well. In fact, I think when moms get together for a much needed weekend away, little-added touches like this really make a trip that much more special. 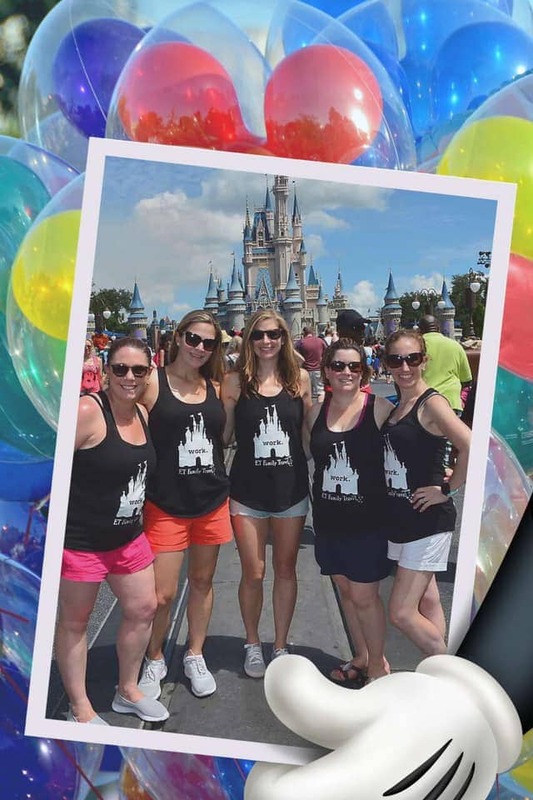 Patty and her friends wore one of those HOME shirts to Disney and I am so in LOVE. I actually have one of these for NEW YORK. I am obsessed with them. This is super smart to do because when you go to Disney the first thing they tell you is, “Welcome Home”. Have you ever realized that? When you check in they tell you that and I LOVE to hear it – I truly do. These ladies wrote WORK instead of home because they are bloggers and have a relationship with the brand. But, if you feel that Disney is HOME to you, this is a great idea and really sweet. 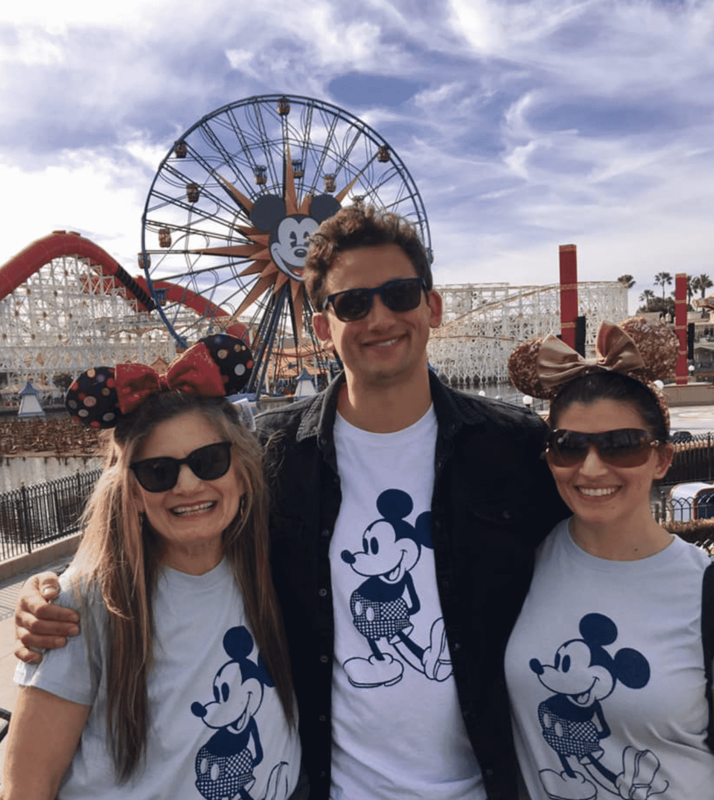 What do you think of these Disney family vacation shirts? I love this mother-daughter look as well! John Lasseter made Hawaiian shirts a thing over at Disney. In fact, it almost became part of the Disney culture because that’s all that the former chief creative officer of Walt Disney Animation Studios would have on while at work. So, now if you go to any convention, park, or Disney run store, you will find a TON of Hawaiian shirts. A TON! Love that this duo took that look to heart. 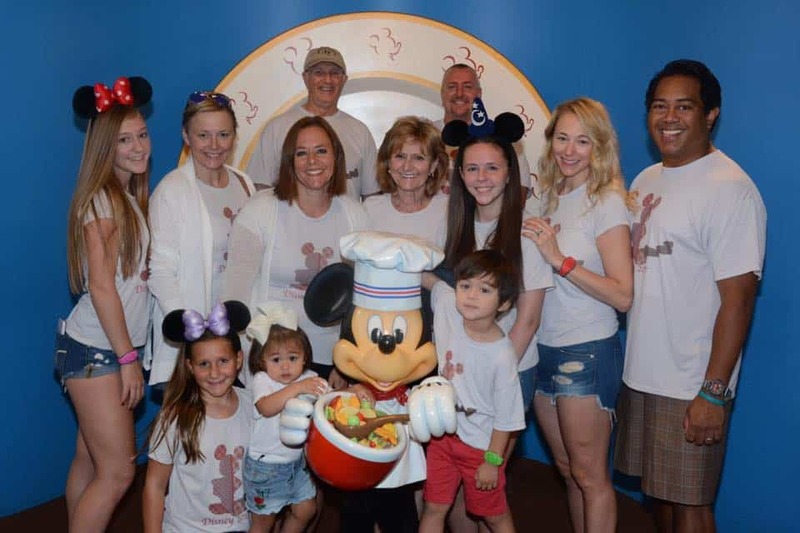 Their Disney family vacation shirts are fab! 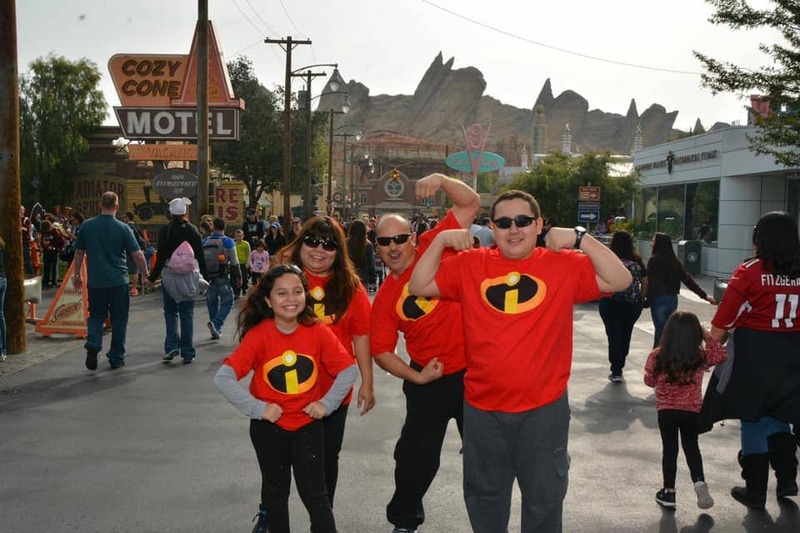 The Incredible Family Vacation! I know I mentioned earlier that you should add the year to your Disney family vacation shirts, but can I let you in on a little secret? If you don’t, then you can wear the shirts AGAIN. When I went on a Disney Cruise a few years ago, I made a magnet for my door and I put the freaking year on it and now I can never use it again. UGH -what a waste! 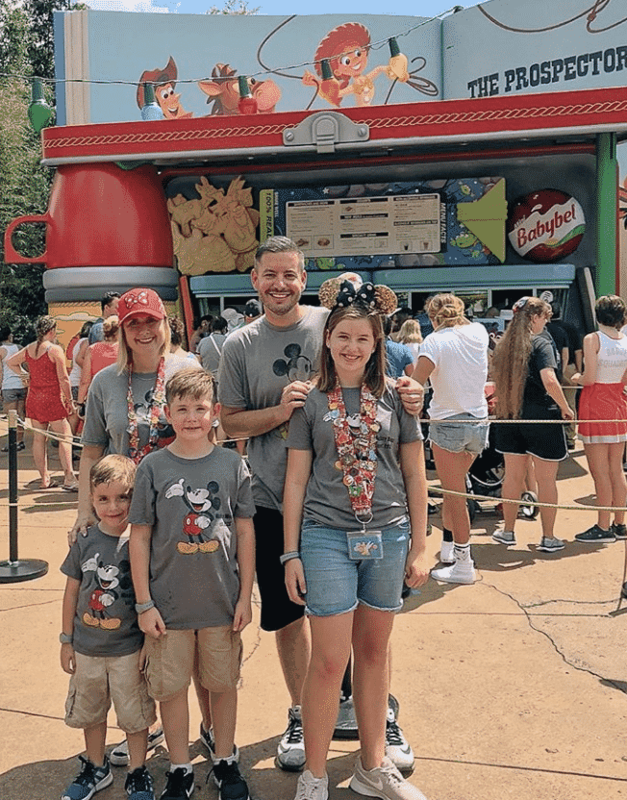 I love that this family didn’t put the year on their Disney family vacation shirts because if they decide to go anywhere else anytime soon, they are covered – literally. What do you think of these ideas for your next vacation? Any of these styles ring a bell with you? 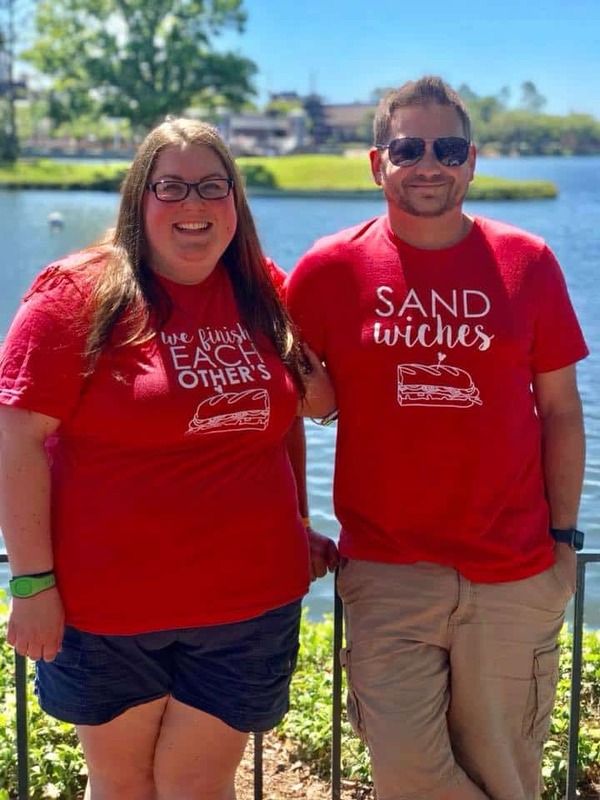 I really do love matching Disney shirts and I hope you will give these a shot! To look at a few more wonderful ideas from my friends, be sure to scroll below. 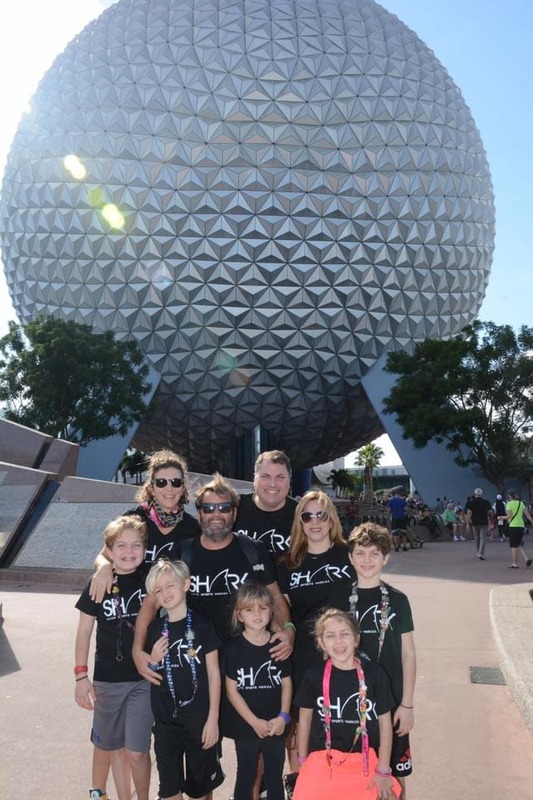 Thanks Sherry for this wonderful photo of your family in matching family shirts! 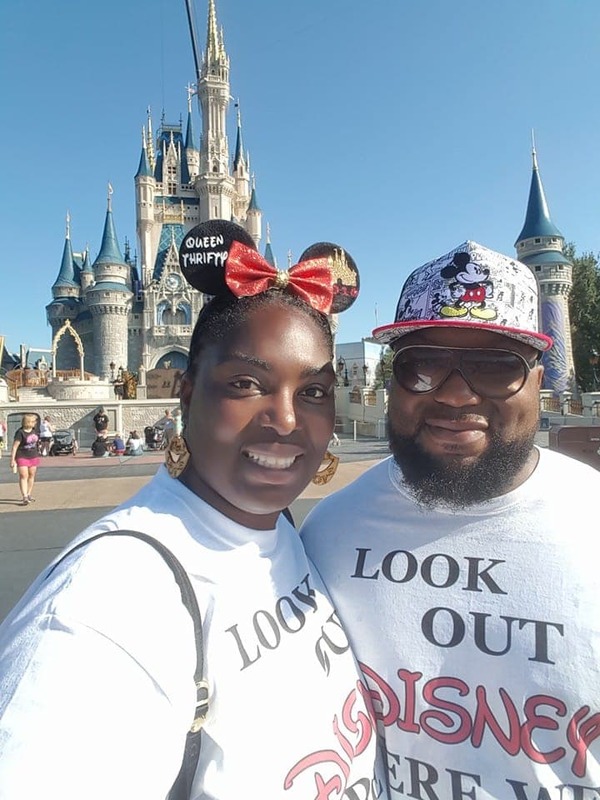 Thanks Ra’Nesha for this wonderful photo of you and your husband in matching family shirts! 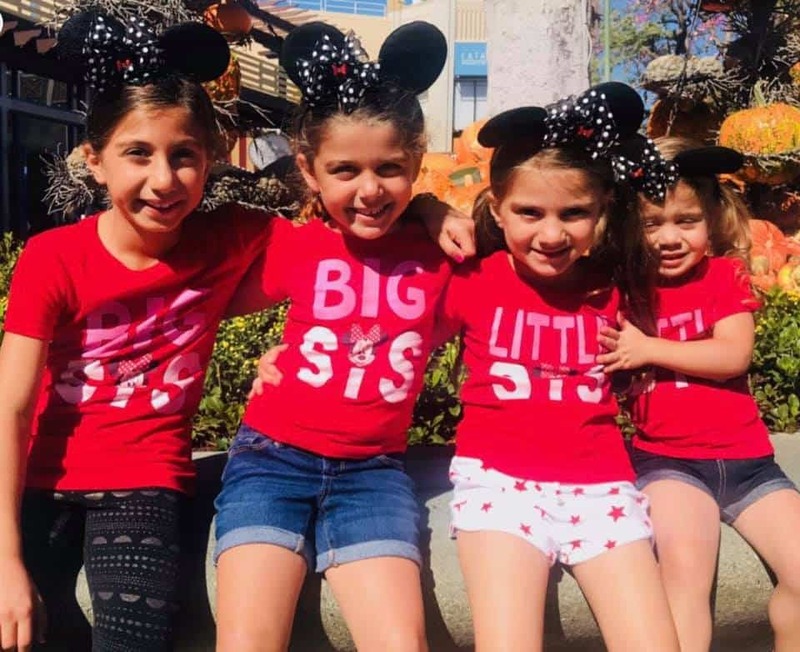 Thanks Jill for this adorable photo of the girls in matching family shirts! Look at this can in their Disney family vacation shirts! I love it! 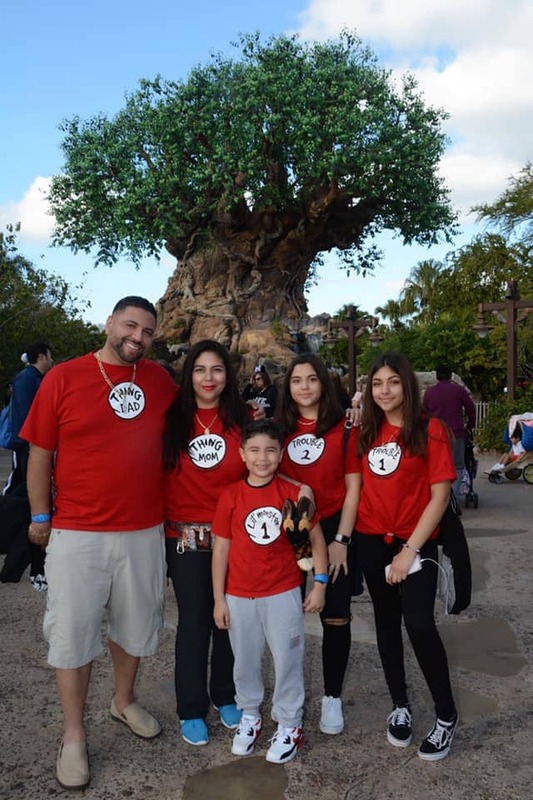 Thanks Destiny for this adorable family photo in matching family shirts!